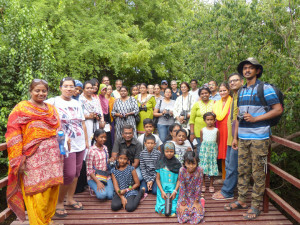 Vikas Madhav led the Bird Walk at Perumbakkam Tank. The Walk focussed mainly on familiarising participants with the resident bird population of this hotspot. Grey Pelican and painted stork were seen in close quarters in reasonable numbers. An unusual number of grey herons were observed. The highlight of the Walk was the sighting of both chestnut and yellow bitterns. 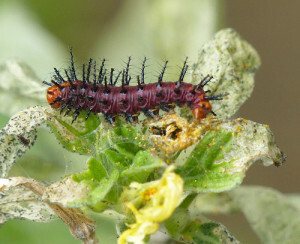 Apart from birds, the participants were also shown other fauna like insects and reptiles. The participants were given an introduction to Butterflies and their role in nature along with information on butterfly watching by Dr. R. Bhanumathi, Senior Naturalist and Life Member, who led the walk. 45 participants, including 9 children, then went around the Poonga for two hours. The highlight of the Walk was sighting of the uncommon Blue Mormon butterfly that fluttered around in front of one group showing its glistering blue and black wings. 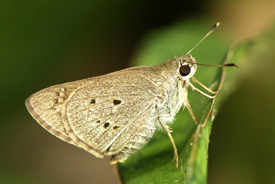 Some of the participants also observed the courtship behaviour of a male Common Crow butterfly that revealed its hair pencil to attract the female Crow butterflies nectaring on the nearby tree-top. The maroon coloured caterpillars of Tawny Coster butterfly were a great attraction for the children, while the Common Jay and Small Salmon Arab posed for many camera clicks. – (Courtesy: Madras Naturalists’ Society bulletin).